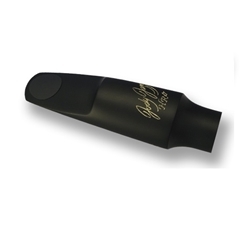 The HR* tenor sax mouthpiece is a round chamber mouthpiece which provides a round sound in contrast to a more focused sound which a square chamber provides. This allows the HR* to sound very pretty and the medium chamber allows the piece to have very good projection when pushed. Tip opening for the 7* is 0.105.